ALPINE–How do you clean a lion’s teeth? With a lot of preparation, care and expertise. Two rescued African lions underwent medical procedures last week at the world reknowned Lions Tigers and Bears, San Diego county’s only accredited non-profit big cat and exotic animal sanctuary. Louie, a 13-year-old male white lion and Zulu, a 16-year-old female lioness, underwent dental examinations and treatment to follow-up from previous dental procedures that the pair underwent earlier this year. 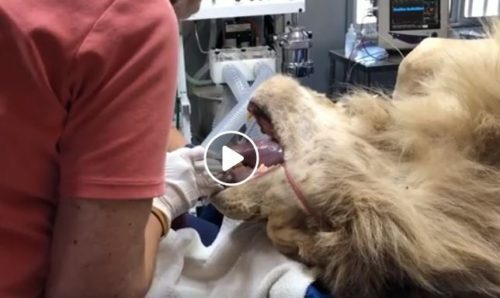 Louie, had a right maxillary canine root canal and the veterinary team also assessed the lion’s allergic skin disease which appeared to be under control at the time. Zulu, who suffers from inflammatory bowel disease, which now appears to be under better control, had previous dental work assessed and two temporary caps installed. The team also made a treatment plan for a future procedure to treat the re-growth of a ginigival mass and to install permanent caps. “Captive exotic animals often come to us with a variety of chronic medical issues resulting from years of inadequate care, neglect or abuse,” says Bobbi Brink, Founder and Director of Lions Tigers and Bears. “We are so thankful to animal lovers around the globe who support our efforts to make this essential care possible so these animals can live healthier, pain-free lives.” Dr. Ryan Sadler, Resident in Zoological Medicine and Surgery at the University of Tennessee College of Veterinary Medicine, and Dr. Allison Woody of Pacific Coast Veterinary Dentistry and Oral Surgery, Inc., oversaw the procedures, which took place at Lions Tigers and Bears’ on-site medical suite. Both lions were sedated and carefully monitored during the exams and both have made a full recovery. Louie and Zulu, along with another female lion named Arusha, were relinquished to Lions Tigers and Bears in April 2017, by their private owner, a former animal trainer who used the trio in circus performances and the television and film industry. Lions Tigers and Bears is home to more than 65 animals, spanning 19 species. The sanctuary offers guided educational visits, four days a week by appointment. Reservations are required, and funds generated help support the sanctuary’s goal to “Rescue, Educate and Protect.” The sanctuary is currently working to raise funds to update and purchase new medical equipment for their on-site surgery suite. Equipment includes an ISTAT machine to monitor animal’s bloodwork during procedures like this, a portable sonogram machine and digital x-ray machine. This equipment will also be used when the team conducts rescue operations throughout the United States. Since 2010, Lions Tigers and Bears has coordinate the rescue, medical care and relocation of more than 200 animals throughout the United States. For more information, visit www.lionstigersandbears.org.